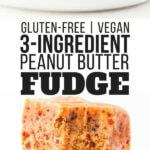 3-Ingredient Peanut Butter Fudge – Healthy and Vegan! 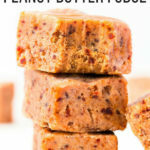 This no-bake 3-ingredient peanut butter fudge is made with coconut oil instead of condensed milk and requires only a good food processor or blender. Quick and easy to make, this no-fail healthy dessert is gluten-free, dairy-free, naturally sweetened, vegan and… extra creamy! These, my friends, are 100% no-bake, no-fail, and no-guilt fudges. 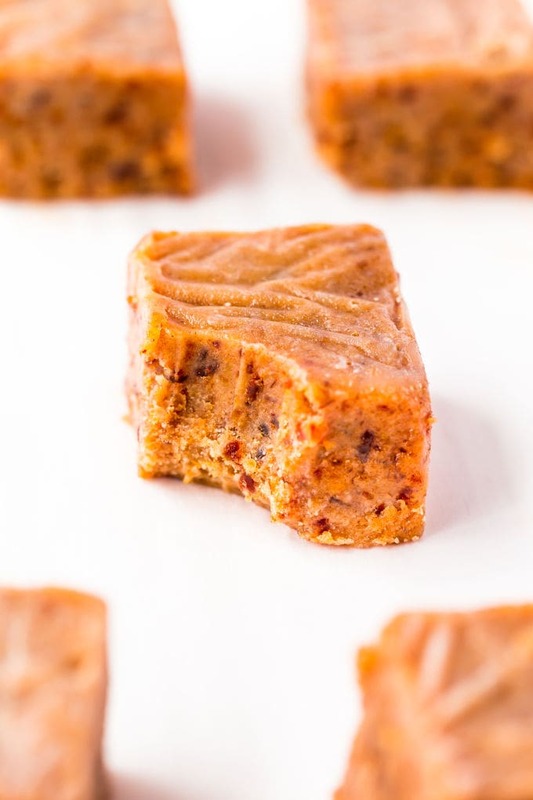 These little squares of happiness are made with nothing but the best, healthiest ingredients and whipped up under 5 minutes. There is one thing that needs to be said straight away about those: Keep them in the fridge. Yup, these are fridge fudges. Not only will they taste way better right out of the fridge, they will also become very soft at room temperature because of the coconut oil. And we don’t want that, right? 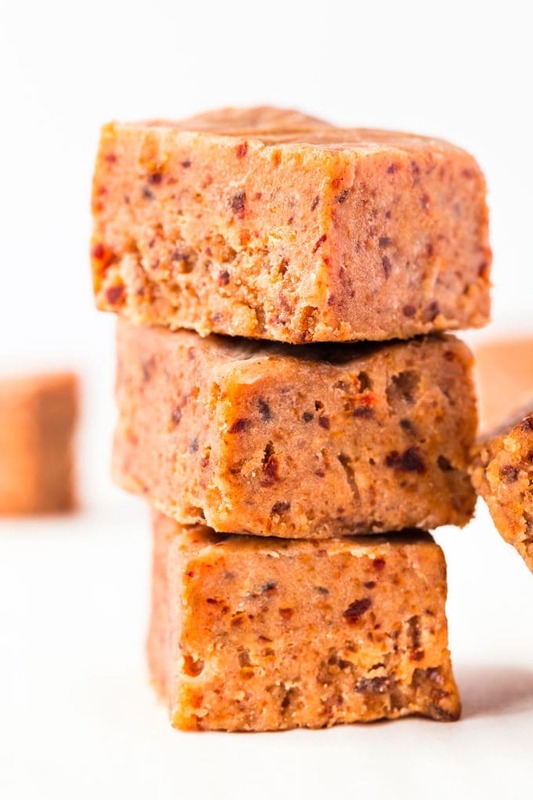 Like my vegan vanilla fudge recipe, these contain a high amount of healthy fats. they cannot be considered keto as the dates they contain add a little bit too much (healthy) carbs. So before you ask: nope these are no fat bombs. 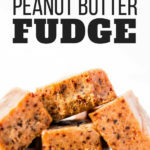 How Do You Make Peanut Butter Fudge? Like I said earlier, these are very easy and quick to make. You will only require a good food processor (or blender) and a little bit of patience. There is an important step which needs to be done 30 minutes ahead of making this recipe and it is to soak the dates in water. After that, I suggest you melt coconut oil before processing. If you use a food processor, that is. If you are using a high-velocity blender from a brand like Vitamix, Blendtec or Ninja, then you probably don’t need to. After these two first steps are completed, simply process all of the ingredients until smooth, then pour the mixture into a baking pan lined with parchment paper. Refrigerate for at least 3 hours before cutting into squares. You could use muffin cups and fill the bottom to make peanut butter Reese fudge cups. In the first iteration of this recipe, I did not use coconut oil. Simply dates and peanut butter. It was very tasty, but would not hold together unless it was left in the freezer. If you like frozen treats, I suggest you try it! Use dark chocolate chips instead of dates, for a creamier but naughtier dessert. Do you have to keep this fudge in the fridge? It is preferable, yes. As stated above, not only will it taste better this way, but it will also not hold very well together at room temperature because of coconut oil. How long does peanut butter fudge last in the refrigerator? It can be kept in the refrigerator for up to 7 days. 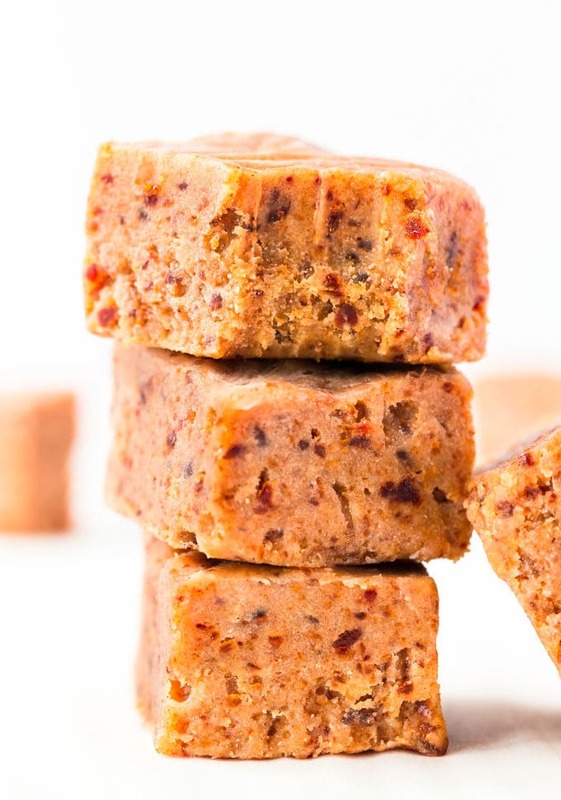 Can you freeze peanut butter fudge? 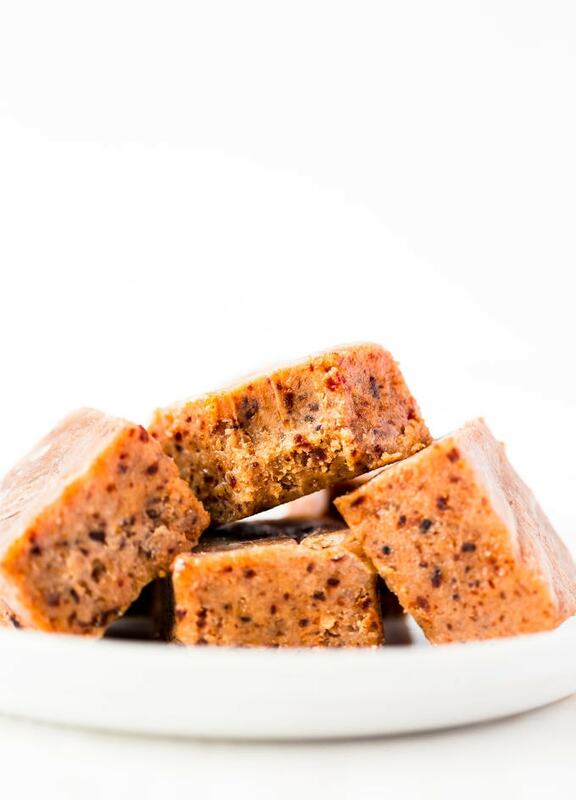 Peanut butter fudge can be kept in the freezer for up to 3 months in a sealed container. What do you use instead of evaporated milk? Evaporated milk is replaced by coconut oil, for a much healthier, guilt-free dessert. How long should you wait for the fudge to cool? Leave the fudge in the fridge for 3 to 4 hours before cutting, especially if the coconut oil has been melted. How long do you process it for? If you are using a food processor, you will need to wait at least 30 seconds before you get a nice creamy texture. With a high-velocity blender unit, it will be quicker. You want the mixture to be as creamy and as homogeneous as possible. 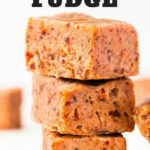 This creamy and fudgy peanut butter fudge is so quick and easy to make, it feels like cheating! Line a banana bread baking pan with parchment paper. Soak the dates in water for 30 minutes. All of them should be completely immersed in water. Melt coconut oil over low heat in a small saucepan. Add in the peanut butter and process again, for 15 to 30 seconds. Pour the mixture into the baking pan and spread evenly. Refrigerate for 3 to 4 hours before cutting into squares. These fudges are to be kept refrigerated as they will become very soft at room temperature.